There has been a lot of confusion surrounding the names “pressure canner” and “pressure cooker”. The two terms are very often used interchangeably by many people. Well, there are some reasons for this. First of all, these names sound very similar in the first place. Maybe they are synonymous, right? Second, the appliances themselves indeed look similar. Third, if other people say so, then we can say so, too – at least that’s what most people believe, either consciously or unconsciously. However, pressure canner and pressure cooker are actually two different things. They are not synonymous to each other. Fine, you can use either of the two for pressure cooking, but one of them has an additional functionality. You can ask: Could a pressure canner cook? Could a pressure cooker can? Now, let us see first the definitions of “pressure canner” and “pressure cooker”. Then, we will see what things that they can do, as well as the differences between them. Next time you go to the market, make sure that you choose the right thing, pressure canner or pressure cooker. 1 What is a Pressure Canner? 2 What is a Pressure Cooker? What is a Pressure Canner? A pressure canner is a heavy-duty kitchen appliance that features a vent, a pressure gauge, and screw clamps. It is used to seal the food in a closed environment and heat the food to higher temperature levels than boiling water by using heat and pressure. The size is usually quite large, as it is designed for home canning of foods. It is also used for canning some particular high-acid foods. A pressure canner should have a pressure gauge present with the valve in order to use it for canning low-acid foods and meats. You will have to monitor the pressure gauge and adjust the heat continuously in order to maintain the recommended pressure level for a certain period of time during the canning process. What is a Pressure Cooker? A pressure cooker is simply an airtight pot which is used to cook foods quickly using heat and steam pressure. It is available in several models, either as a stove-top appliance or an electric device. Since it uses pressure to cook, it usually has a valve in the locking lid which is used to help regulate the pressure level in the pot during the cooking process. 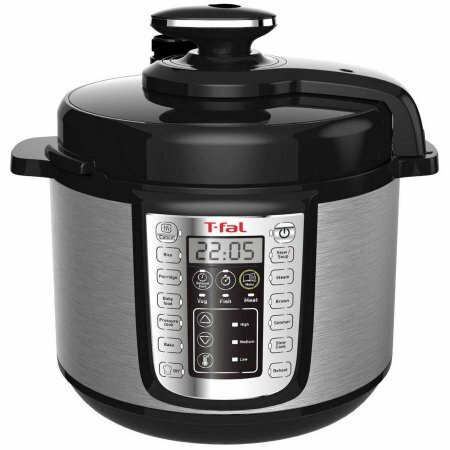 Many people use pressure cookers in order to cook foods quickly, as pressure cookers indeed require just a fraction of the time needed by regular pots or oven roasters to cook. You can use a pressure cooker to cook various types of foods, meats, and pasta sauces. A pressure canner usually comes at a larger size than a pressure cooker. This is because a pressure canner is designed to be able to can relatively larger foods such as meats. Due to the larger size, it is not a surprise that a pressure canner is usually heavier, too. In terms of design, a pressure canner always has a pressure gauge, which is an essential feature to enable the user to monitor and control the pressure level. On the other hand, a pressure cooker may come in a variety of sizes, though it is generally smaller than a pressure canner. A stove-top pressure cooker is usually pretty compact. There are some stove-top pressure cooker models that are ‘flat’, like saucepans but even thinner, and these are typically used for cooking meats. Meanwhile, an electric pressure cooker can be almost as large as a pressure canner. It is usually more lightweight. A pressure cooker also has a valve for controlling the pressure level, but often does not come with any pressure gauge for precise measurement. Both pressure canners and pressure cookers can be used for pressure cooking. You can use a pressure canner to cook just like you cook with a pressure cooker. However, pressure canners are indeed more sophisticated equipment than pressure cookers; typically, pressure canners are able to create higher pressure and temperature levels than pressure cookers. Then again, if you just want to cook a small portion of meat, using a large pressure canner is probably impractical, and thus a pressure cooker would be more suitable. However, you can only use a pressure canner to can foods. Using a pressure cooker for canning is not recommended at all. It will not give a good result. Pressure cookers are not as sophisticated as pressure canners. You need higher pressure and temperature levels to can foods, and the lack of a pressure gauge will make it very difficult to control. If the proper pressure and temperature are not reached and maintained, the canning process will fail to destroy harmful bacteria that cause botulism. Therefore, for canning, don’t use a pressure cooker instead of a pressure canner. A pressure canner is a more sophisticated piece of equipment that is meant for a more difficult task, canning, so it is not surprising that the product comes with a more expensive price tag. Pressure canners are typically more expensive than pressure cookers. On the other hand, pressure cookers are usually cheaper because they are relatively simpler and only meant for one less-demanding purpose, which is cooking. Since pressure canners are more expensive yet can be used for both pressure cooking and canning, you are probably tempted to buy just one pressure canner to do all tasks. However, you should consider getting both a pressure canner and a pressure cooker. Cooking just a 4-lb piece of meat using such a large pressure canner is inconvenient. You can use a pressure cooker instead in such case. 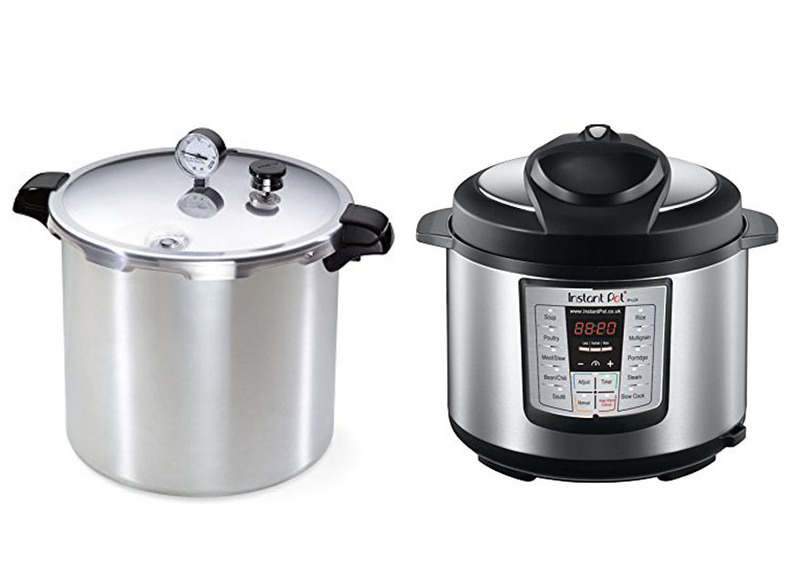 Pressure canners and pressure cookers are two different entities. Pressure canners are usually larger, featuring a pressure gauge, a valve, and screw clamps. 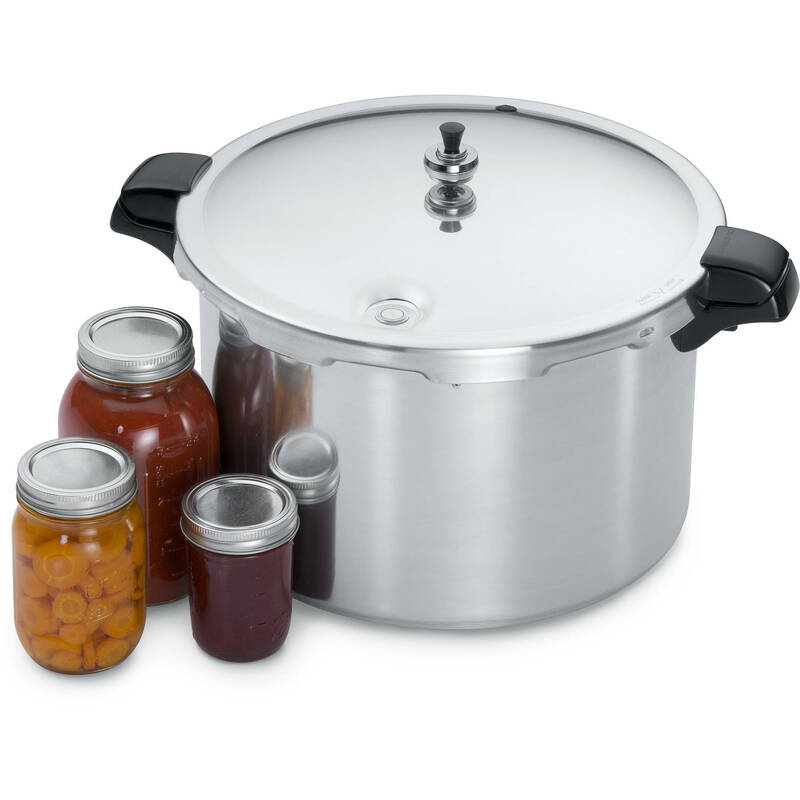 They can be used for cooking, but they are particularly designed for pressure canning. You need a pressure canner in order to can foods properly and really kill all harmful bacteria that may cause botulism. On the other hand, a pressure cooker is a simpler and more affordable device, usually without a pressure gauge, designed only for cooking.